A start-up 3D printing company announced a move that may help propel the technology forward. On Monday, a company called CloudDDM unveiled a 3D printing factory embedded in middle of UPS' worldwide hub in Louisville, Ky.
As business picks up, CloudDDM expects to expand the Louisville operation to as many as 1,000 3D printers. Beyond that, he has global ambitions. . The first-of-its kind, fully-automated facility will be able to use the tie-in to UPS to ship its products quickly. "We'll have 100 high-tech 3D printers running 24 hours, 7 days a week," said CloudDDM's founder Mitch Free. And it'll need just three employees: one for each of the eight-hour shifts. UPS will handle all of the packaging and shipping logistics, so no personnel will be needed for those functions. 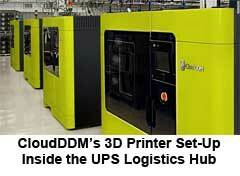 CloudDDM says it will use the 3D printers to make prototypes and product parts for corporate customers. Customers submit their orders online by uploading a 3D file. At that point, the companyâ€™s software immediately estimates the price. Orders start printing once a customer enters credit card information. "We are turning around orders that typically take a week to complete in 24 hours," Free said, adding that orders can range from one to 1,000 pieces. Free claims that because factory can process hundreds of units at a time will cut costs for customers by at least 50% compared to traditional manufacturing. "The speed factor is critical for product designers," said Free, who invested over $1 million in the facility. "Any package sent anywhere in the world with UPS goes through [its] worldwide hub. So why not locate the factory there?" It should be noted that UPS has taken a minority stake in CloudDDM through the UPS Strategic Enterprise Fund. Free added that "Direct digital manufacturing, or DDM, is taking additive manufacturing, also referred to as AM, to the next level. Our systems are almost entirely automated, from the time a user uploads a digital model, through production, and on to packaging and shipment. Direct digital manufacturing allows us to be incredibly efficient and produce parts, in large volumes, at prices competitive with traditional manufacturing methods." New York-based Humanscale, a maker of ergonomic office furniture and tools, is one of 10 companies that have been testing Cloud DDM's services. It started using CloudDDM eight weeks ago. Humanscale's in-house design lab has a small-scale 3D printer, but frequently uses outside vendors for larger orders, said Peter Kreider, the firm's prototype manager. "We use 3D printing in prototyping virtually all of our new product developments," said Kreider. That means quick a turnaround is vital to get new designs finalized and manufactured. Free has a roster of customers queued up, including Flextronics, lluxury watchmaker Devon Works and Stratos Aircraft. "We are already exploring replicating our capabilities in Asia and Europe," said Free. Any reaction to these global manufacturing numbers? Let us know your thoughts at the Feedback section below.